— my daughter Athena, who was mildly concerned. There are several answers to this, most of which boil down to the fact that I am a father who remembers being the ten-year-old boy who fell in love with Madeleine L’Engle’s book, and the movie engaged both of these states. I cried because the casting and performance of Meg (played by Storm Reid) is immensely good — such a stubborn, willful, doubt-filled girl — and because I could see both myself as a child and my daughter in her. I cried because I remember being a fatherless child and being a father who would never want to leave his daughter. I cried because the film has empathy not only for bright but difficult children but for all children, and because it wants so much for Meg to see herself, just as I would want to be seen and would want my own child to see her value. I cried because I remembered being lost like Meg was lost, and remembered everyone who helped me find myself, as everyone in this film does so for Meg, and as I hope I have helped my own daughter become who she is meant to be. I cried because this film has an enormous amount of empathy, as the book did, and that essential core remains intact, even as the film takes liberties with the source material. It would have to, 56 years after the book’s initial publication, to speak to the audience it’s intended to speak to, which is not me, a 48-year-old white dude, although it clearly and so obviously did. I cried because this film gets the book right, because it sees the book, just as the book saw me when I came to it almost four decades ago, and has seen so many other children since. Director Ava DuVernay’s love of the material, and her willingness to put the work into it to make it speak today, is self-evident and appreciated. It is not a perfect film, in itself or in its adaptation of the source material. Lots is truncated, changed and elided, some new stuff is put in to middling effect. The commercial needs of a $100 million film mean that some tropey elements get past the gate, and on more than one occasion the special effects become the tail wagging the dog. In the end I didn’t see much of this as a problem. The film is not perfect, and also, this is a film about faults, and how our own faults ultimately may give us power to save ourselves and others. While I’m not going to say this film’s faults ultimately give it power, I can say that none of the film’s faults are that important to me when the film’s core is solid, and intact, and so powerfully on point. It’s not perfect, nor does it have to be to work. Should you see this film? Well, I think you should. I also think you should see it on a big screen, because it’s visually impressive enough to warrant it and because films still have their most potent power on a big screen, in front of an audience. Maybe it won’t have the same effect on you that it had on me — in fact, it probably won’t, because you are not me. But I’m willing to believe it will have some effect. Whatever that effect is, it’ll be worth getting yourself to a theater for, and maybe taking a kid or two along with you, too. As for me, I can honestly say that I don’t think I’ve been this affected by a film in years. Part of that is because I loved the book as a child, but I’ve loved other books before, and their adaptations, and yet didn’t spend their entire running time in tears. 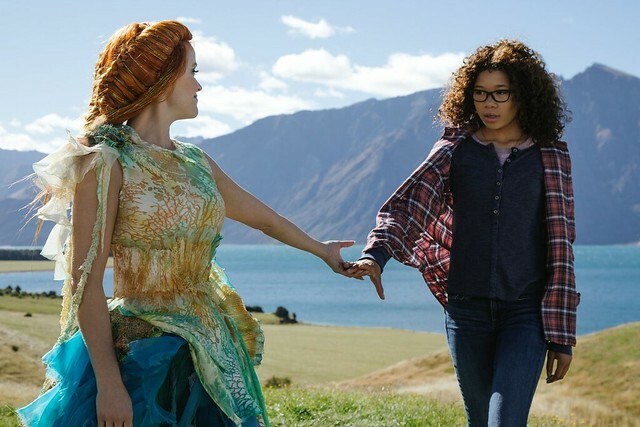 I think, in the end, it’s what Ava DuVernay, her team and her actors (especially Storm Reid) brought to it: Empathy, joy, optimism and their own point of view that brings A Wrinkle in Time into modern times. No one needs me to tell them that DuVernay is a major director; that much was evident with Selma and 13th. What I can say is that DuVernay, rare among directors, is now someone whose vision I trust — not to give me what I think I want, but to give me what I didn’t know I needed, until she showed it to me. I knew I was probably going to like A Wrinkle in Time. I didn’t know I was going to love it this much. I certainly didn’t know I was going to find myself crying all the way through it. That’s on DuVernay and her team. And for that, I say: Ava DuVernay, thank you. I don’t think it’s possible for your film to have moved me more than it has.